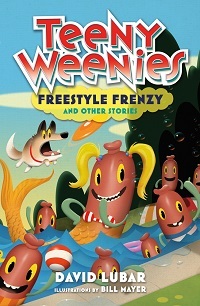 Freestyle Frenzy and Other Stories, the second book in the Teeny Weenies series, brings younger readers a dozen wonderfully weird and creepy stories in the style of the popular Weenies books. Suspiciously swift swimmers at a school swim meet cause a frenzy. A boy who likes to litter finally gets the meaning of Earth Day. A girl and her dad go on a fishing trip and catch the surprise of a lifetime.